To make your wife feel love forever for you from the bottom of her heart. Here are 60 Islamic guaranteed ways for real couples making love. Make her feel secure, QUIT BEING AGGRESSIVE. When you advise her, do so in privacy, in a peaceful environment. NOT IN PUBLIC as it’s a type of slandering. Don’t be rigid. It will break you. Prophet Mohammed SAW (SAW – “Sallal lahu Aleihi Wasallam” means “May the blessings and the peace of Allah be upon him (Muhammad)’) said ‘I am the best amongst you and I am the best to my wife’. Being rigid and harsh will not bring you close to Allah and neither does it make you more of a man. YES to flattering NO to arguing. Arguing is like poison in a marriage. Al zawai said ‘When Allah wants evil for people He will leave them to argue amongst themselves’. Give her a pleasant surprise, i.e. if she loves watermelon, bring her one out of the blue. It will grow the love in her heart. All of us have shortcoming. 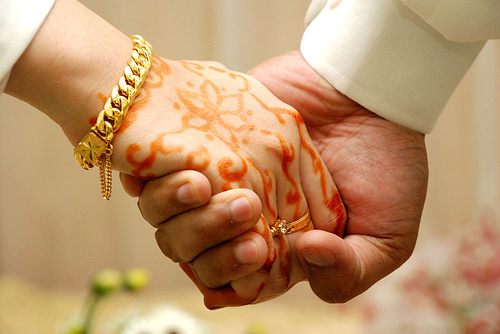 Accept her shortcoming and Allah will put barakh in your marriage. Call your wives with the best name, any name she loves to hear. Prophet Mohammed (SAW) called Khadija ‘Ya Khadija’ as an endearment. In front of her relative praise her. Confirm / realize that she is wonderful, and that she is a good person in front of her family. Think good of your spouse. We have a demand from Allah that we have to think good of people. Ignore some of her mistakes – pretend you did not see/hear some of her small mistakes. It was a practice of Ali (RA). It’s like putting a hole in your memory. Don’t save it in your memory! Increase the drops of patience, especially when she is pregnant or when she is on her monthly period. Expect and respect her jealousy. Even Maulatona Khadija (ra) used to get jealous. Be humble. If your profession is good, respect that she is looking after your children, she is much more than you, she is the leader at home, her strength is your strength, and her success is your successes. Help her respect your parents, you can’t force her to love them, but she can be helped to gradually love them. Remember your wife in your prayer. It will increase the love and protect it. Leave the past. It brings nothing but pain and grief. It’s not your business. The past is for Allah. Don’t try to show her that you are doing her a favour by doing something, like buying food for the house, because in reality we are the courier of sustenance, not the providers, as Allah is the provider. It’s also a way of being humble and thankful to Allah. Take the food and put it in her mouth. Prophet (SAW) taught us this. It’s a blessing. The food doesn’t just go to her stomach, but straight to her heart. It increases the love and mercy between you. Show her your smile. Smile at your wife. IT’S A CHARITY. Small problems/ challenges can become a big problem. Or if there is small thing she didn’t like and you keep repeating them anyway, it will create a wall between you. Don’t ignore them as it can become big. Avoid being harsh hear-ted and moody. Allah said of Prophet (saw) ‘if you were harsh hear-ted they (the companions) would have left you.’ It confirms prophet (SAW) was not harsh hear-ted, so GET RID OF IT. Respect the intimate relationship and its boundaries. Prophet (SAW) said she is like a fragile vessel and she needs to be treated tenderly. Sometime she may not be feeling well; you must respect and appreciate that feeling. Help her to take care of the children. Some men think it makes them appear less of a man but in fact it makes you appear a bigger man and more respected, especially in the sight of Allah. Let her know you are traveling. Don’t tell her out of the blue as it’s against Islam. Tell her the date/ time of when you are coming back also. Don’t leave the house as soon as trouble brews. Encourage each other for ibadah, i.e. plan a trip for hajj or umrah together. It increases and strengthens the love when you help each other perform a good deeds together i.e, do tahajuud together, or go to a dars together etc. Allah said ‘live with your wives in kindness.’ Treat them with kindness and goodness. It means in happy times and in sadness treat her with goodness and fairness. Prophet (SAW) showed that at the time of intimacy. Don’t jump on your wife like an animal! When you have a dispute with your wife don’t tell everyone. It’s like leaving your wounds open to germs so be careful who you share your problems and disputes with. Don’t think you are always right. No matter how good you are you have shortcomings. You are not perfect as the only one who was perfect in character was Prophet (SAW). Get rid of this disease. Have good intention for your wife all the time, Allah monitors your intention and your heart at all times. Allah said Among His Signs is that He created for you wives from among yourselves, that you may find repose in them, and He has put between you affection and mercy. Verily, in that are indeed signs for a people who reflect. When you go home say ‘Assalmualikum. ‘ (Greetings) It kicks the shaitaan out of your home! AVOID ANGER. HOW? Keep your wudu at all times. Prophet (SAW) said if you are angry, sit down, if you’re sitting, then lie down. Follow the sunnah! Prophet (SAW) described the wife as a fragile vessel and said to take care of this vessel that’s fragile. Remember that there is goodness in this vessel so treat it gently. Shaitaan is your enemy, not your wife. Sometime when husband and wife are talking a fight breaks out, then shaitaan is present there as a third person so he is the real enemy. It is not enough to hate the shaitaan, but you have to see him as an enemy as Allah has commanded. Shaitaan loves divorce. HE comes everyday and sits office and asks the devils what they have done, some say i have made a person steal, or i have made someone drink etc. And one devil will say i have made a man divorce his wife, and he is crowned as the one who has done the best job.